WASHINGTON (AP) — Mosquitoes harbor gut bacteria just like people do — and the bugs inside the bugs may hold a key to fighting malaria. Today, bed nets and insecticides are the chief means of preventing malaria, which sickens about 200 million people around the world and kills 400,000 a year, mostly children in Africa. But what if scientists instead could hatch malaria-resistant mosquitoes? Johns Hopkins University researchers reported Thursday that beneficial bacteria living inside a mosquito’s gut can help do just that — two somewhat accidental discoveries that, if they pan out, might one day offer a novel way to protect against malaria. Malaria is spread by female Anopheles mosquitoes that bite an infected person and then, after the disease-causing parasites incubate inside the insect’s gut, pass on the infection by biting someone else. People, animals, even insects harbor a community of mostly healthy intestinal bacteria, what’s called the gut microbiome. Researchers have long known that some of those natural mosquito germs are capable of attacking malaria parasites. The hurdle: How to spread that protection to enough mosquitoes in the wild to make a difference. One Hopkins team discovered an oddball strain of bacteria that mosquitoes can easily pass to one another. Called Serratia AS1, it lives in both the gut and ovaries of mosquitoes. Unlike other mosquito germs, males transmit this strain to females during mating, and females can infect their offspring. Genetically altering that bacteria to emit some anti-malaria compounds suppressed parasite growth without hurting the mosquitoes. Researchers fed the revved-up germs to a small number of mosquitoes and let them mate with normal mosquitoes in the lab. Sure enough, the entire next generation harbored the malaria-suppressing germ, Hopkins malaria researcher Marcelo Jacobs-Lorena reported in the journal Science. In a second set of experiments, Dimopoulos’ team made an even more curious discovery. They altered a mosquito immunity gene to make it more active and help the insects better fend off malaria in the first place. Somehow, that subtle genetic change also altered the insects’ usual gut bacteria and made them more attractive to mates. 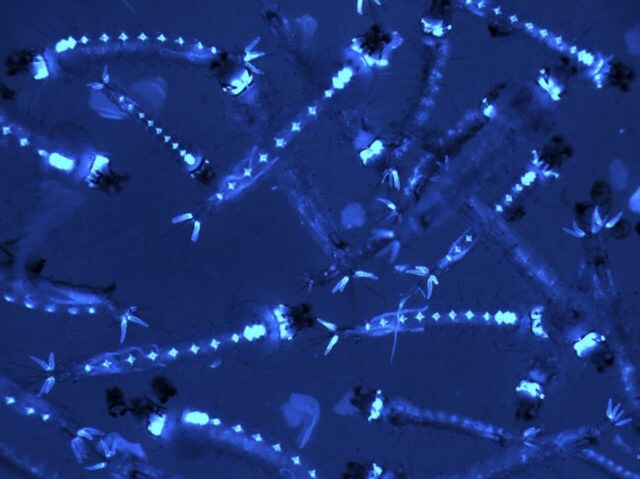 Modified male mosquitoes began seeking out unmodified females, and unmodified males sought out modified females, Dimopoulos said. The theory is that tamping down gut bacteria altered the mosquitoes’ scent. Whatever the explanation, a colony of mosquitoes in Dimopoulos’ lab has retained malaria resistance for seven years. Mosquito experts not involved with the research called the work promising. “Since it is unlikely there will be a silver bullet that solves the issue of malaria, we need to pursue all the available tools in our arsenal to combat the disease,” said Grant Hughes, an assistant pathology professor at the University of Texas Medical Branch. Penn State University entomologist Jason Rasgon said the findings are exciting because they go beyond the hunt for better malaria control. “It’s a new avenue of fundamental mosquito biology — how the microbiome affects behavior,” he said. What works in the lab doesn’t always work in the wild. Next year, the Hopkins researchers hope to try hatching malaria-resistant mosquitoes in a somewhat more realistic setting, a net-covered greenhouse-like field station in Zambia.